You will surf the perfect waves and enjoy your much-needed vacation at Soul Surf School in exciting Australia. Australia is one of the best choices for surfers due to the fabulous weather all year round, suitable for beginner to professional level. You will enjoy the ride from the start until you find yourself longing to come back again. During this holiday, you will totally relax and immerse yourself in friendly Australia. The surf sessions, which are daily surf safaris, will take you to some stunning surf locations that are perfect for learning to surf. 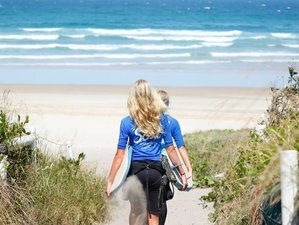 The four lessons are a complete introduction to surfing so whether you have never surfed before or want a refresher course, the experience is tailored specifically for you. Enough time will be spent explaining ocean safety which ensures that you will know the safe area to surf or swim.